As I want the environment to be controllable by the user, a small scripted tool will accompany the scene. It will be used as a simpler way to interact with the variables in the scene and allow the user to set-up the environment to suit their needs. I have created the interface in Maya and although not functional yet, it serves as a good outline for what options I want to have. I’ve used frames in order to split up the various sliders. The environment controls will handle things like the time of day, and the properties of dynamics already in place in the scene (such as the vents of gas on the surface). The storm controls alter the variables which will be used in the storm expression. The storm expression will be coded separately and will use the user set variables to control the attributes of objects in the scene. Last semester I used a form layout to position objects on the interface. This time I have used frames which allows me to split up the sliders, as well as allow easy addition of new sliders into the window without the need for manually inputting form positions. Most of the sliders will go from 0 – 100 for ease, the “Time” slider will probably go from 0 – 24 to represent hours of the day. I may change this to a simple day/night slider or restrict this to certain hours as I am not yet sure how I would move the light source around to achieve a day/night cycle. 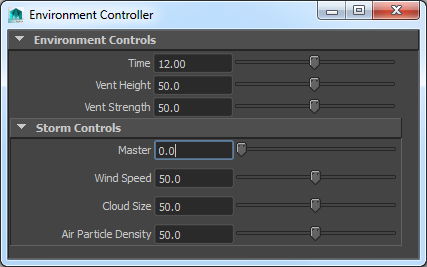 The “Master” slider would remain at 0 by default, setting this to 100 is essentially turning the storm on and choosing its intensity.